The Alaska Department of Transportation & Public Facilities (ADOT&PF), in cooperation with the Alaska Division of the Federal Highway Administration (FHWA), is proposing to reconstruct the intersection of Airport Way and Cushman Street in Fairbanks, Alaska. 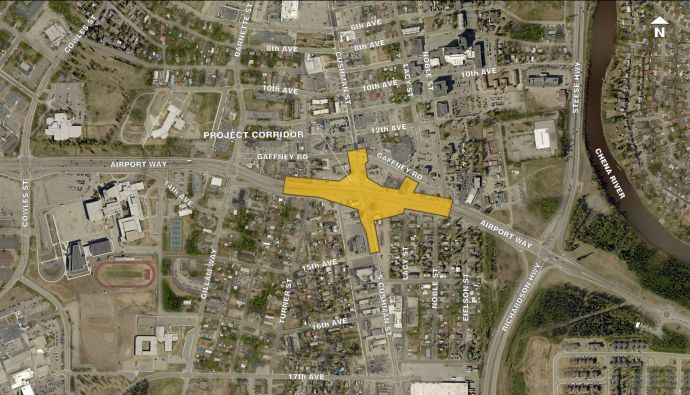 The purpose of the proposed project is to modify traffic operations to improve motorist and pedestrian safety, improve air quality, and decrease delays at the Airport Way intersection with Cushman Street. Get the above map in PDF format. Construction is planned for 2022, contingent on available funding. Comment Map – We want to hear from you! Please use the Comment Map to make comments, or submit your comments to comments@airportcushman.com.